You probably haven't been waiting with bated breath for this, but I've only just managed to get my PC back in some semblance of order after temporarily losing the last 6 months worth of images! As I mentioned in the last blog, I moved on to the Truganini Reserve at Taroona, in search of Swift Parrots. There's a familiar ritual to arriving, you can usually count on seeing, or at least hearing, the local Yellow Wattlebirds as you park your car, and on this morning they didn't disappoint. Their interest was in a pair of Grey Currawongs, skulking about, and at least 3 Kookaburras, and the wattlebirds managed to move them all on, without getting too close. By the track, I witnessed nuptial feeding by a pair of Crescent Honeyeaters, and overhead, much chasing among the Black-headed Honeyeaters . So it appeared that for some, breeding was underway. 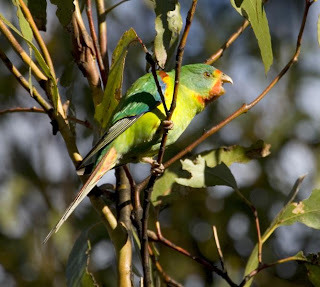 Within a 100 metres of the entrance, I heard the first Swift Parrots, so at least I now knew they were about. 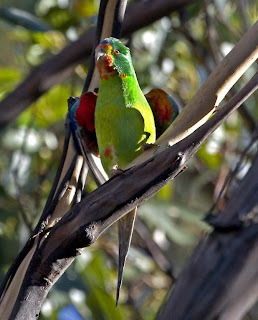 But, as anyone familiar with watching Swift Parrots would be aware, hearing them is one thing, seeing them is another! The calls were emanating from some of the taller eucalypts, mainly Blue Gums, although few, if any were flowering here. I climbed the bank on the northern side of the gully, up into the morning sun, and as I did, I could hear other Swifties calling. I estimated that there were about 6 or 7 pairs in the area, but as yet I hadn't seen a single bird. 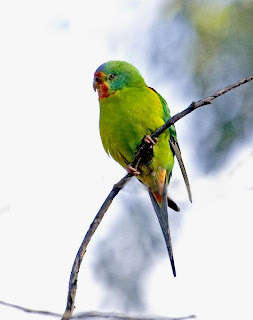 The shrill call of a nearby Musk Lorikeet caught my attention, and it was then that I saw my first Swift Parrot, well to be precise two, undoubtedly a pair. Both were in dispute over a possible nest site, with both Musks and Swifties entering a hole in a gum, some 15 metres up. The Musks used there "tail spreading" act, to warn off the Swifties, and the Swifties, opened their still folded wings to show the red colouring beneath. They also showed their displeasure as seen in the, not very flattering, shot at upper left. Neither of the pairs actually came into contact with one another, preferring to animatedly display as mentioned, sometimes within a few centimetres of one another. It's the first time that I've witnessed this, and unfortunately it was among the foliage and some way from me, so I didn't get the sort of images that I might have hoped for. After about 10 minutes of this action, both pairs flew off, but as I returned a little later, I disturbed a single Swift Parrot from the vicinity of the same tree. 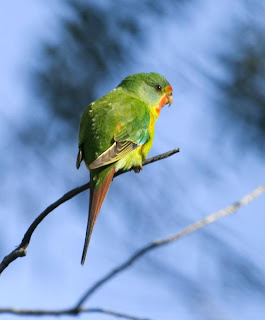 I did speculate whether the confontation was a common occurrence, and is the increasingly numerous Musk Lorikeet population having a detrimental effect on the already threatened, Swift Parrot's breeding chances. Higher up the slope, I noted the single Swift Parrot, pictured at lower left. It called from a high perch at the extremity of a dead gum. It appeared to be alone, and its frequent calling was not answered, perhaps it was in search of a partner, or had become separated. Later, on the track back down into the gully, I also recorded Pink Robin, Olive and Golden Whistlers, Tasmanian Scrubwrens (very quiet, which leads me to believe, they are nesting), a solitary Brush Bronzewing, and numerous Strong-billed Honeyeaters, some gathering strips of bark for their nests. It was while I was watching the latter, that I noted another pair of swifties. These appeared to be gleaning insects from the crevices of a large Blue Gum, and amongst the 'strings' of bark hanging down. Going silently about their business made me realise just how much I, and doubtless others, rely on hearing their call to find them, often as they 'explode' from a tree. In fact, thinking back over the years, I couldn't recall too many times that I had witnessed them feeding on anything other than flowering gums. An interesting morning. Thanks Mosura. The truth is that they were on an external hard drive,(one of 3) that I thought was the best way to back them up. The drive became corrupted and denied me access. I downloaded a programme that got them back, but it took 18hours straight! I was able to sleep while it worked away. I'm now backing them up further with DVDs. Oh! the joys of computing. Taroona end. Frankly all thoughts of enjoyable bird watching had gone with the thought of having to lug myself & camera gear up the hill again. One thing I did manage to note as I walked through the bottom end of the reserve was the prolonged calling of a Tawny Frogmouth, which made me wonder what was their purpose of calling in the day time - territorial, or advertising for a mate? Commiserations on your brush with the dark side of modern technology.I have been advised that hard drives (computer or external), shouldn't be trusted after 5 years - I have had 2 die within the first week of purchase. Most of my photos are record shots consigned to ext.harddrive & CD, but any stand out image (very few) I try to keep 4 to 5 seperate copies. Thanks for your comments. I always start at the bottom of this reserve, and walk (plod) my way up, until I've had enough! At least then it's all down hill. There's a good variety of habitats in this reserve, and with it, a good range of bird species, however, I must confess to never having walked the entire track in either direction. I do lament the standard of electronic gear these days. The external hard drive is only a few months old, but I recently installed a brand new modem/router for someone, only to find it was faulty. That along with DVD recorders, set top boxes, internal hard drives and my own router, which have all failed before their time, makes backing up data/images in less than 2 media, a risky business it seems. If anyone is interested I have produced a DVD on The Swift Parrots of Muckleford, near Castlemaine in Victoria. There is some footage of the swifties, sometimes up to 100 birds feeding on the ground. Love the photo's. Gould's Lagoon Bird Hide Destroyed.